ONE of Britain’s top pub landlords has been honoured after saving a diner from the brink of death. 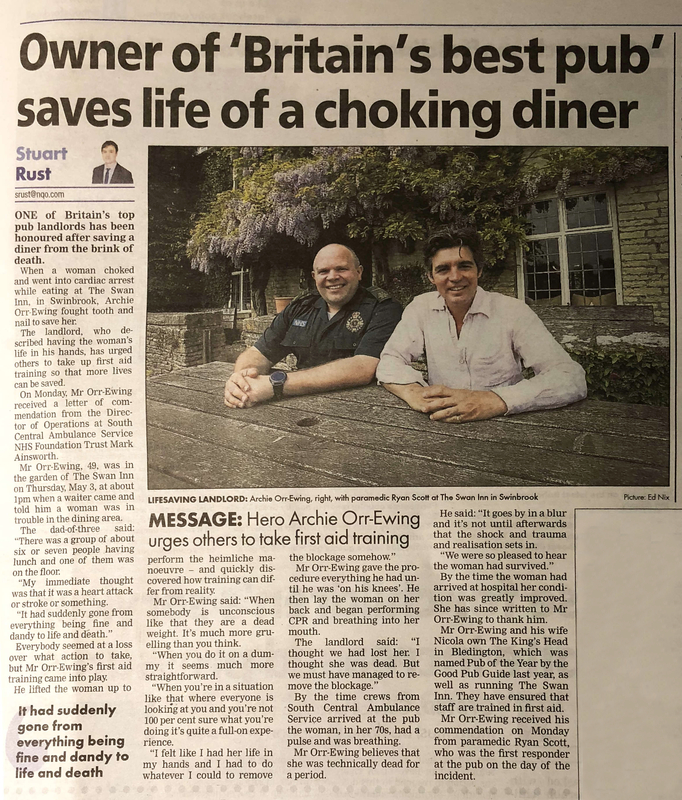 When a woman choked and went into cardiac arrest while eating at The Swan Inn, in Swinbrook, Archie Orr-Ewing fought tooth and nail to save her. The landlord, who described having the woman’s life in his hands, has urged others to take up first aid training so that more lives can be saved. On Monday, Mr Orr-Ewing received a letter of commendation from the Director of Operations at South Central Ambulance Service NHS Foundation Trust Mark Ainsworth. The 49-year-old was in the garden of The Swan Inn on Thursday, May 3, at about 1pm when a waiter came and told him a woman was in trouble in the dining area. The dad-of-three said: “There was a group of about six or seven people having lunch and one of them was on the floor. My immediate thought was that it was a heart attack or stroke or something. Everybody seemed at a loss over what action to take, but Mr Orr-Ewing’s first aid training came into play. He lifted the woman up to perform the heimliche manoeuvre – and quickly discovered how training can differ from reality. Mr Orr-Ewing continued: “When somebody is unconscious like that they are a dead weight. It’s much more gruelling than you think. “When you do it on a dummy it seems much more straightforward. When you’re in a situation like that where everyone is looking at you and you’re not 100 per cent sure what you’re doing it’s quite a full-on experience. Mr Orr-Ewing gave the procedure everything he had until he was ‘on his knees’. He then lay the woman on her back and began performing CPR and breathing into her mouth. By the time that crews from South Central Ambulance Service arrived at the pub the woman, in her 70s, had a pulse and was breathing. Mr Orr-Ewing believes that she was technically dead for a period. By the time the woman had arrived at hospital her condition was greatly improved. She has since written to Mr Orr-Ewing to thank him. 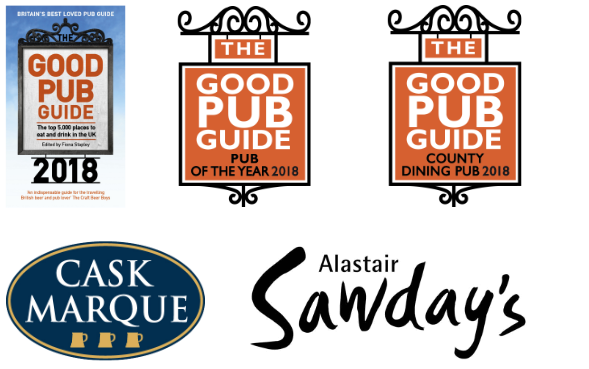 Mr Orr-Ewing and his wife Nicola own The King’s Head in Bledington, which was named Pub of the Year by the Good Pub Guide last year, as well as running The Swan Inn. The pair have ensured that staff are trained in first aid. Pictured above, Mr Orr-Ewing received his commendation on Monday from paramedic Ryan Scott, who was the first responder at the pub on the day of the incident. 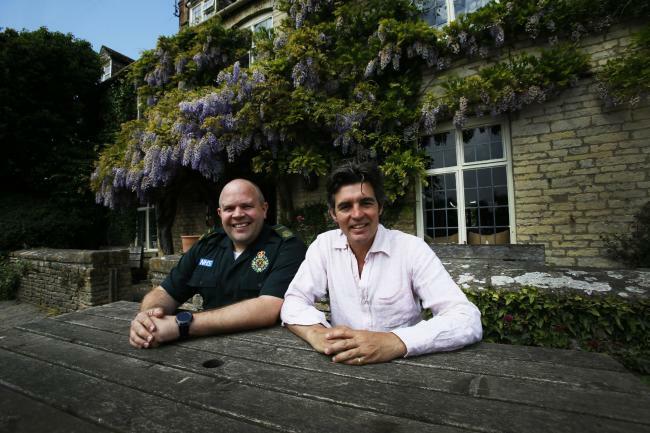 This entry was posted in News, The Swan Inn Swinbrook. Bookmark the permalink.